TAMPA, Fla. (WFLA) - Just in time for Halloween, Applebee's is breaking out the cauldron to brew up a potion fit for the baddest of witches. The new zombie-themed cocktail is causing a fright all month long for just a buck! The ghoulish drink, dubbed the “Dollar Zombie”, features a mix of rum, passion fruit, pineapple, cherry and lime. It's even topped with a gummy brain. 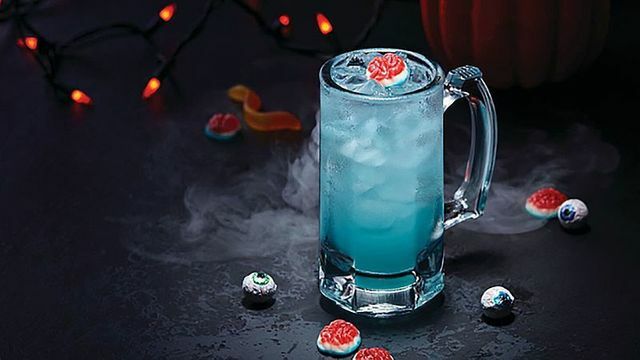 "Halloween is a favorite holiday around here, and we're excited to offer guests the opportunity to celebrate all month long with our new DOLLAR ZOMBIE," said Patrick Kirk, vice president of beverage innovation at Applebee's. The restaurant joked "this will be the only time you'll want to run toward a zombie." CLICK HERE to learn more about this special offer.